For further activities please look to my blog in the “news” column. 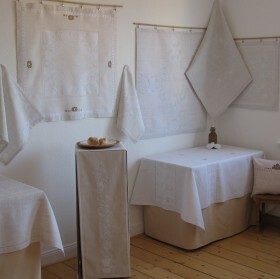 My exhibition, consisting mainly of Schwalm Whitework, is converted into a permanent exhibition. For details please see: My exhibition under “Luzine Happel” tab at the top of the page. 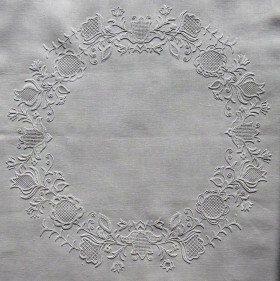 Opened large exhibition of Whitework embroidery. For details please see: My exhibition under “Luzine Happel” tab at the top of the page. – Catalogue-guide for the exhibition. During the exhibition a young lady visited me. She told me that she really wanted to learn Schwalm Whitework. She had already made several attempts, however she was left-handed. Learning a technique with so many different stitches from books written with the right-handed embroiderer in mind was too difficult. She asked me to write a basic book especially for the left-handed embroiderer. I agreed to this request. 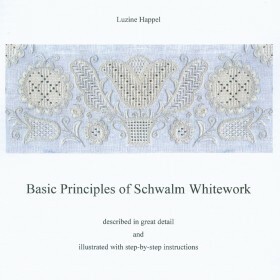 Gradually I turned the images and changed the text of my book, “Basic Principles of Schwalm Whitework”. She tested the instructions and had no problems. So I published this special edition. Later it was also translated to English and to French. My exhibition opened at Easter and I thought of a special decoration. Years ago an aged lady visited me. 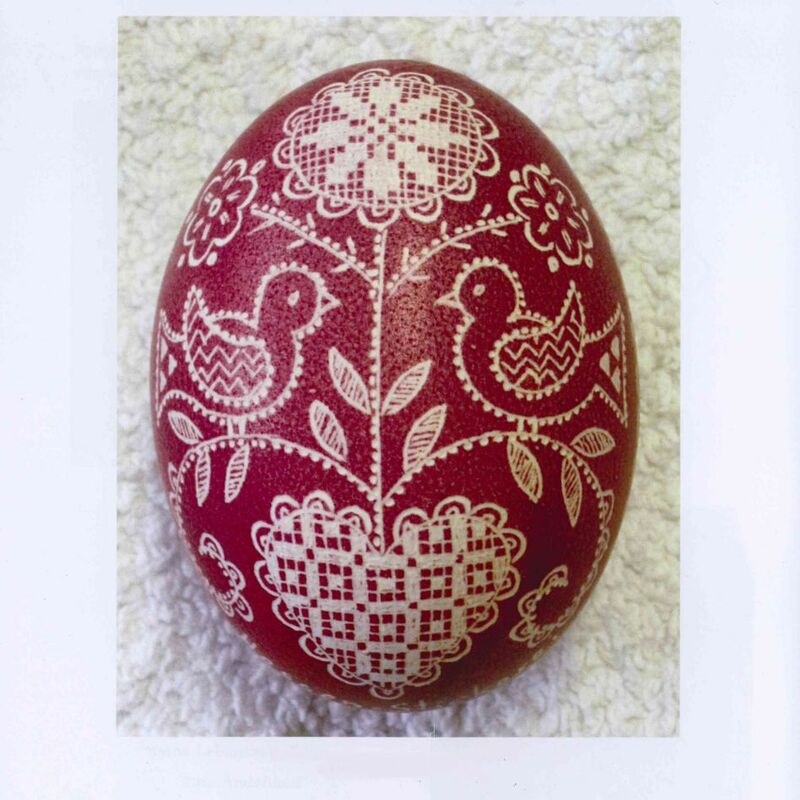 She told me that she could not embroider, but that she did another handicraft – she decorated blown-out eggs with motifs of Schwalm Whitework. On my request she manufactured some of these works of art for me. Nowhere else have I seen such eggs. 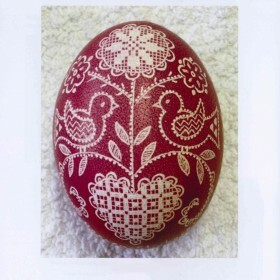 Because they are fragile and transient, I photographed the details and described them in a leaflet with the title “Ostereier – mit Motiven aus der Schwälmer Weißstickerei in Kratztechnik verziert” (Easter eggs decorated with motifs of Schwalm Whitework made by a scratch technique). 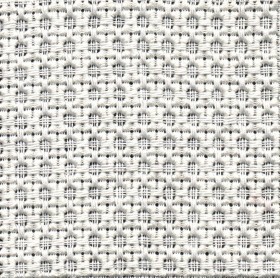 and in the leaflet, “Openwork Pattern Bands”. Perhaps someday I will publish the third leaflet. So to be able to give background information on each piece to interested visitors, I put together a catalogue. In its 145 pages, every item in the exhibition is shown and described in detail. 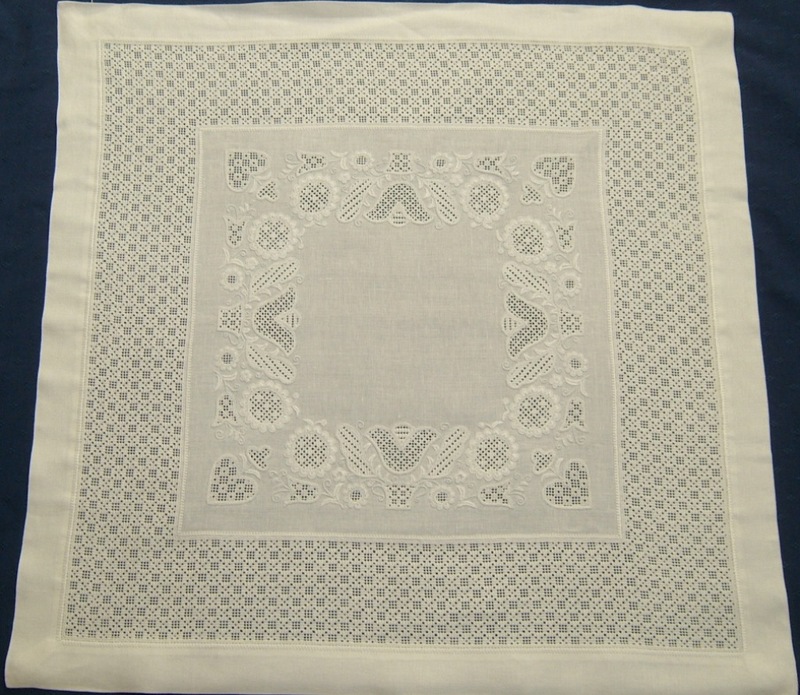 Throughout the past decades, I have accumulated a substantial collection of Whitework items. Many I have worked myself, others I have inherited, received as gifts, or have purchased (usually historical pieces). Thinking of the indignity of having them all stowed away in cupboards, I begin to think about an exhibition. I think about this for a long time and slowly and methodically the exhibition’s “home” was created. The exhibition opened in April 2011. It received great, trans-regional and international attention. Years ago I took a class in Schwalm Whitework learning the “old” technique – as it was called there. It was so very interesting and extremely well suited for special designs, and so I methodically sought out more examples in museums and out-of-print books. I noticed that no other author of instruction books mentioned this subject. I thought it would be regrettable should this attractive type of Schwalm Whitework slide into obscurity. 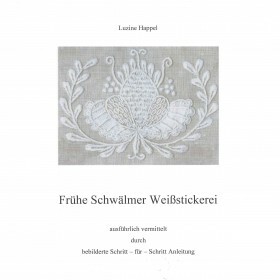 Therefore I published another book titled “Frühe Schwälmer Weißstickerei”. 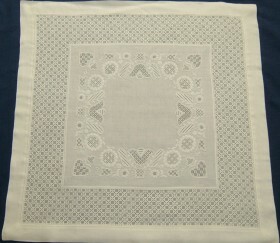 Later it was translated into English as “Early Schwalm Whitework” and into French as “ La broderie des Schwalm ancient”. Working together on “BPSW” (Basic Principles of Schwalm Whitework) was a fun and enriching experience, and so we decided to also translate and edit “Randabsch­lüsse”. My co-worker not only wanted a good trans­lation, but also wanted the reader to under­stand and to comprehend every step. 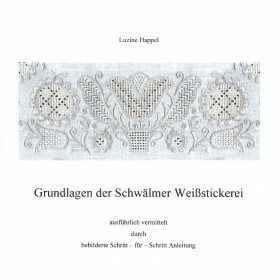 Examples were newly embroidered and described; the book was changed and further developed. So, the English edition resulted in being an expanded and improved version of the German edition. 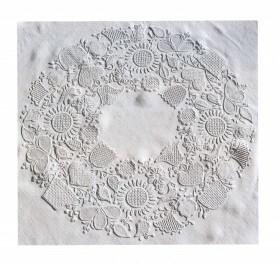 Here, I also wish to thank Joey for her absolutely unselfish support and efforts to bring the technique of Schwalm Whitework to the English-speaking embroidery world. 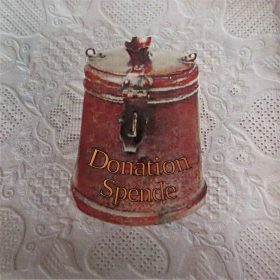 Early 2009, I received an inquiry from an American embroideress – Joey Colbert – concerning an English trans­lation of my basic principles book. I told her that I had a very rough English trans­lation – the result of several previous trans­lation attempts which had failed because the trans­lation offices could not under­stand all the technical terms. We decided to try a collaboration. At first, Joey did not know any German word, but she worked very carefully and precisely. 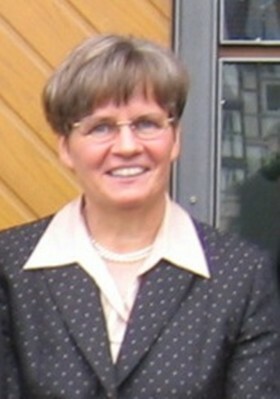 My English knowledge was good enough to proofread and to ascertain that her editing corres­ponded with my German text. Hundreds of emails were exchanged between Eugene, Oregon and Eschwege. 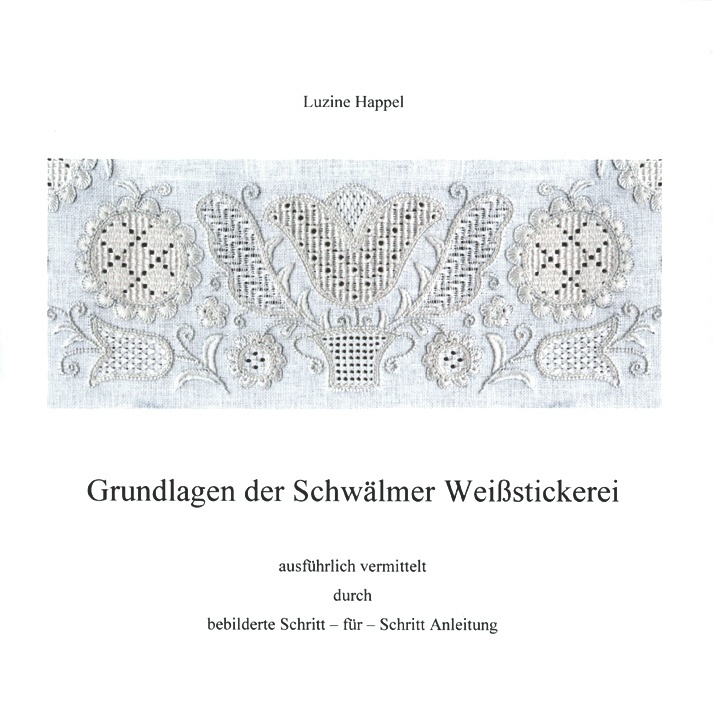 We wrote, corrected, improved, changed again and checked until we, through time-consuming and painstaking work arrived at the book “Basic Principles of Schwalm Whitework”. 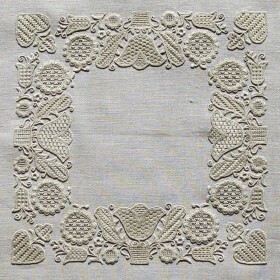 Early 2008, I received a request from a French teacher, Jacqueline Blanot, concerning Schwalm Whitework. She asked if I would consider combining her French trans­lation of my books with my pictures. 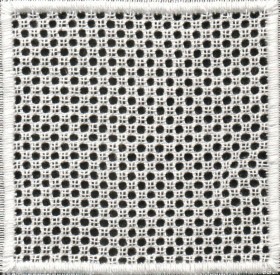 In this way “Les Bases de la Broderie de Schwalm”, “Finitions et Bordures”, “Samplers”, “Point de Reprise”, and later “Limet­rosen II” developed. During a visit to Eschwege, Jacqueline showed me a stitch – heretofore unknown – called the “Tulle-Croix”. 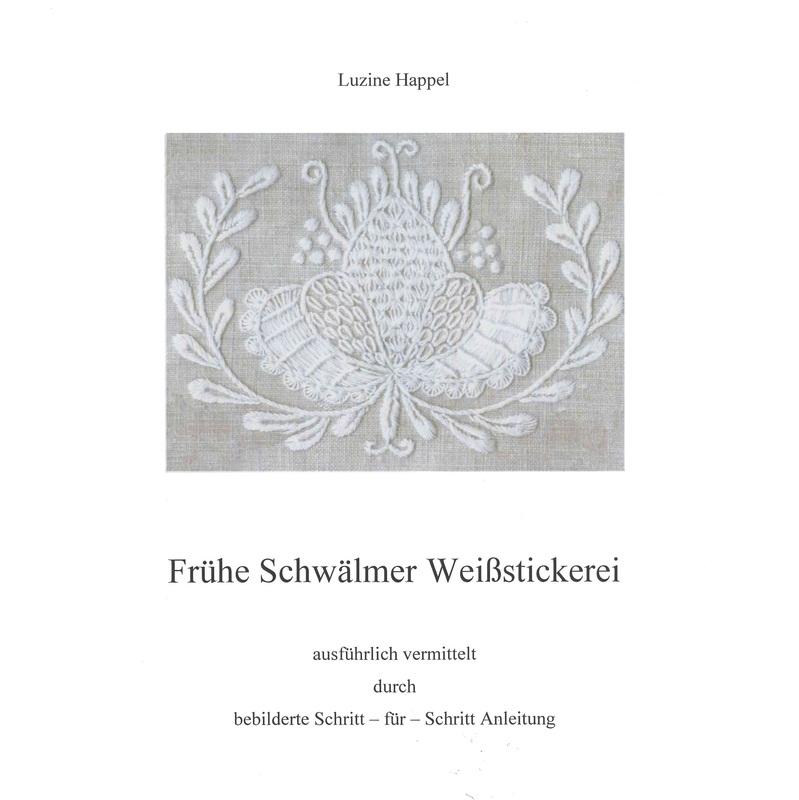 I called it “Fanzösischen Stich” (French stitch) and published it with some variations in my book “Muster­tücher”. 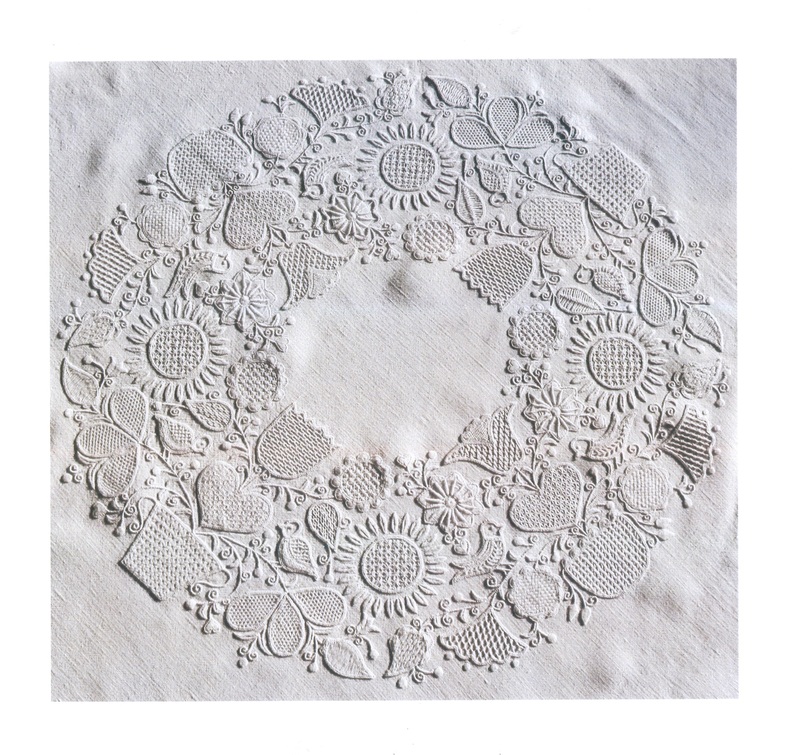 Here, I wish to heartily thank Jacqueline for her support and her efforts to bring the technique of Schwalm Whitework to the French-speaking embroidery world. In 2007 I received a request from Canadian embroiderers asking if I could help them by planning and working a certain sampler filled with openwork patterns. I set to work and soon deduced the challenges of the project. However, I was able to map out in detail all the correct steps of working the sampler, and published this project in 2008 as “Muster­tücher”. While combining different stitches into one hem decoration, I noticed that not all of my “good” ideas worked well when embroidered. It came to me to develop a unit const­ruction system that would allow playful experimen­tation without investing great amounts of time to test out a combination. I embroidered and scanned all possible kinds of hems, made them compatible in size and put them on cutting sheets. With the individual paper pieces, anyone can have fun experimenting with combinations and then embroider their own hem design with complete confidence. Even for groups, this playful exploration is joyful and stimulates creativity. Later the text was also translated to English. 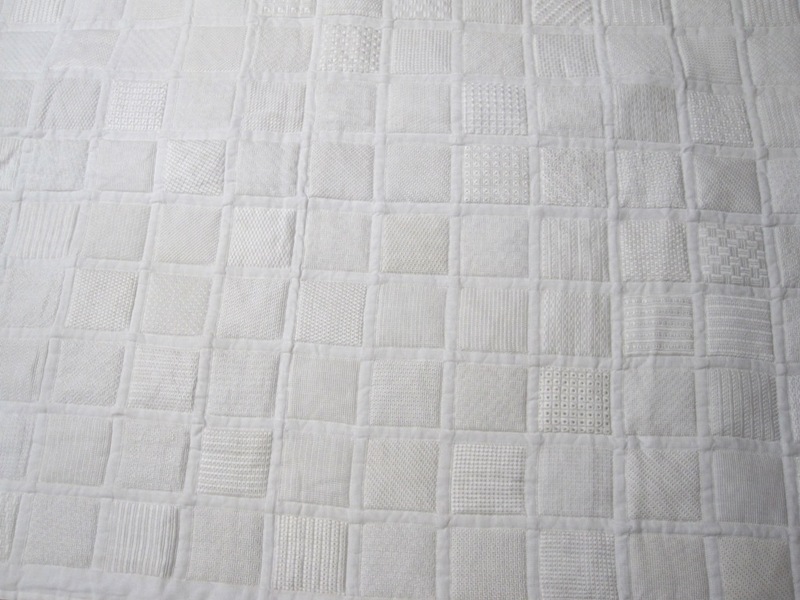 In order to easily compare traditional and new patterns, I worked a third project (white fabric, item 1-2002). 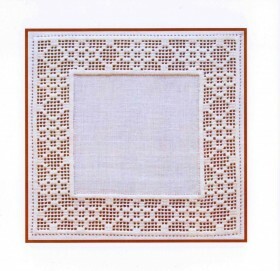 Using the same linen, I embroidered traditional Openwork patterns (cut 2, leave 2) into the same design. 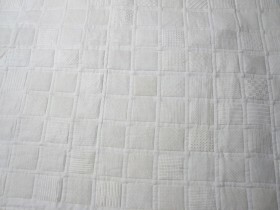 The chosen hem – also created in an Openwork pattern – was very elaborate and labor intensive. 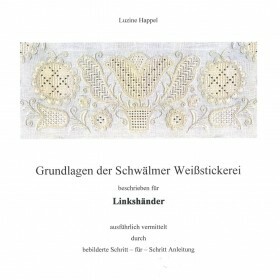 During the tedious work, I got the idea to publish “Randabsch­lüsse” for interested embroiderers. Always explaining each step in word and pictures, I experimented with variant stitches and stitch combinations, and different corners. 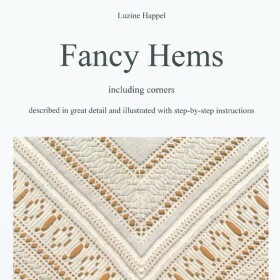 I noticed that the conven­tional schematic description for needleweaving hems held the risk of misleading the embroider, and so I developed a useful system. My system helps the embroiderer to visualise how the band is worked by showing the course of the needleweaving bridges over the single units. So, I started to work. I chose the same design I had embroidered before. 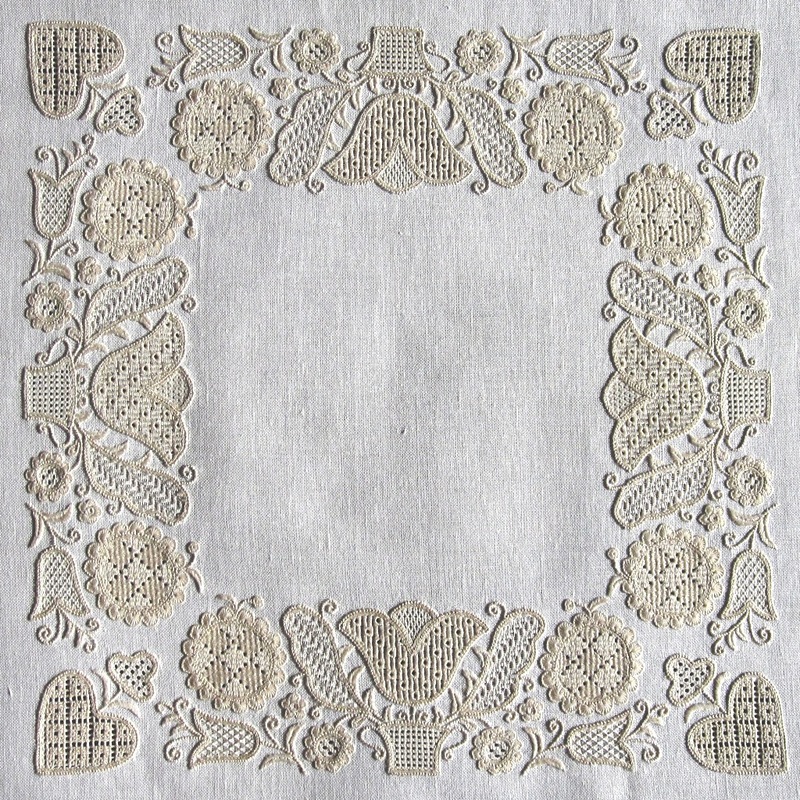 The design incor­porated nearly the entire selection of Schwalm motifs – hearts, tulips, circles (suns), baskets and leaves – and contained enough motifs to demonstrate all the basic stitches. 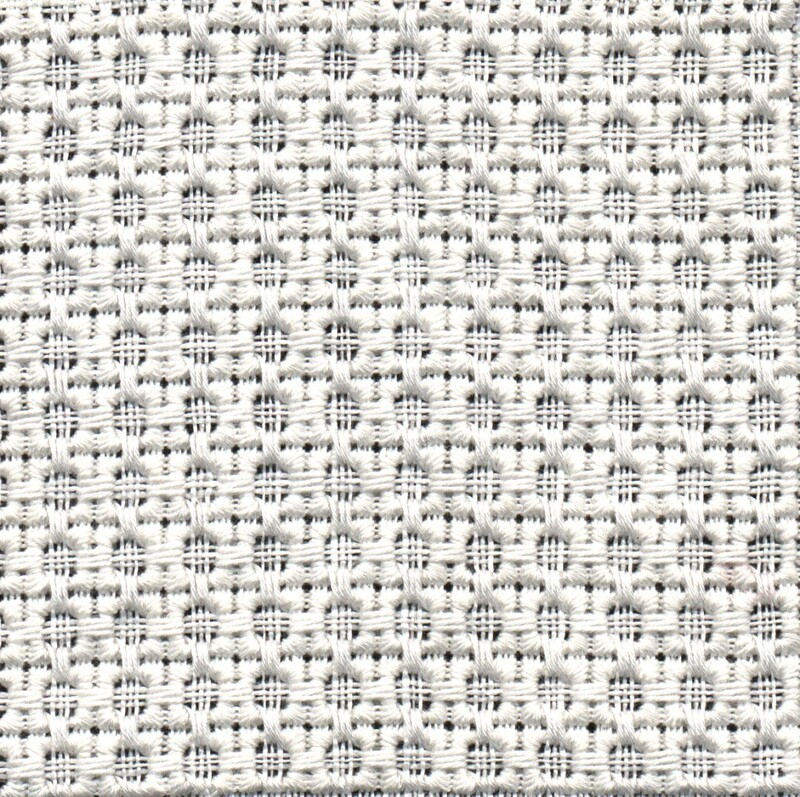 Since white on white embroidery does not lend itself to clear and detailed pictures, I chose beige thread and white linen. I embroidered, ironed, scanned, embroidered again, always writing down my method and working steps. In the end, project and book were finished. I called it “Grund­lagen der Schwälmer Weiß­stic­kerei”. The book was acknow­ledged a success. I received many reports that it was indeed possible to learn this exquisite type of whitework completely on one’s own and without the help of a teacher. The numerous pictures, descrip­tions, and the step-by-step instruc­tions make this possible. 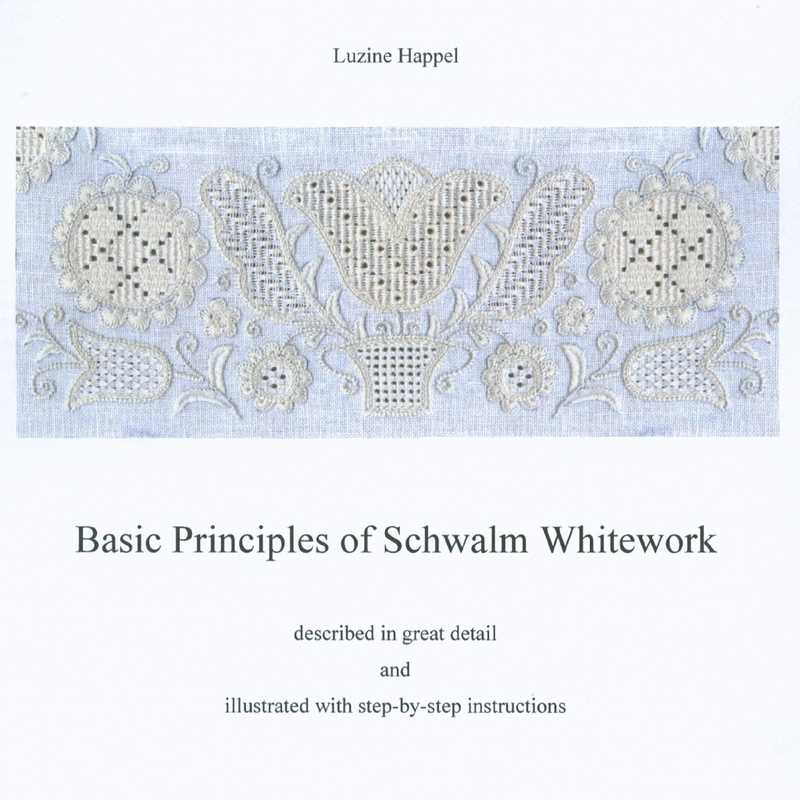 In the meantime, I received more and more requests from embroiderers asking me to explain – in a book – the basic principles of Schwalm Whitework. I had thought there were enough books about this subject on the market, but I was convinced otherwise. Embroiderers, not able to attend specialised courses, wanted to have the means to learn this technique on their own. They wanted brief and succinct, yet precise and clear, instruc­tions in a book. At the time, books and articles in specialised journals were not thorough or comprehensive enough to enable one to learn on one’s own. 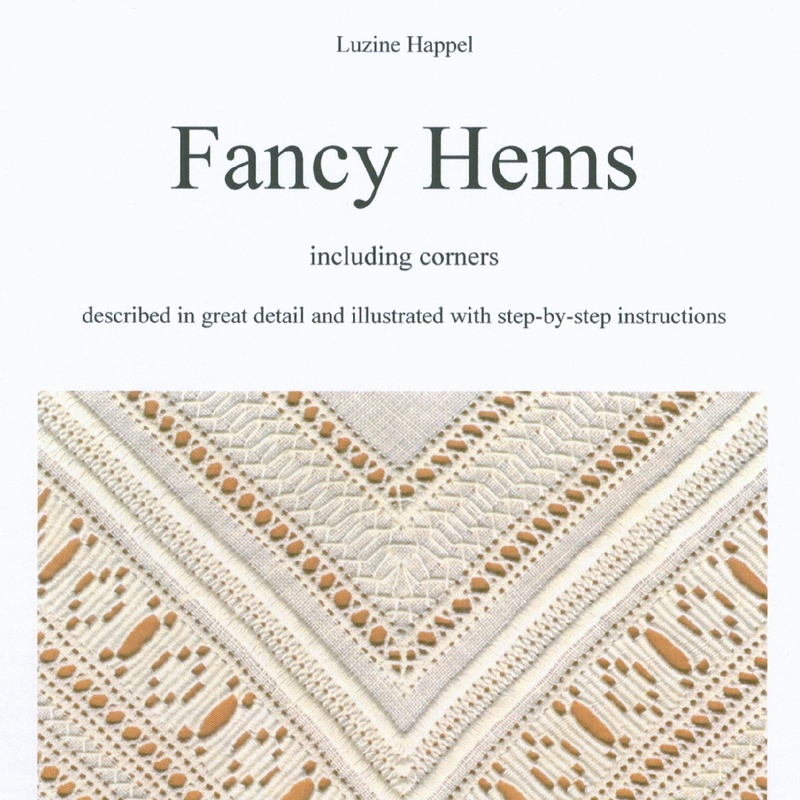 Because of the success of my first pattern book “Limet­rosen I”, I published more patterns of my sampler. This time I chose to focus exclusively on “Wickel­stiche” (Satin stitch) patterns. And so “Wickel­stiche I” was published. Having an abundance of additional Satin stitch patterns, I considered publishing a second volume. However, I was still discovering more interesting patterns, and so I refrained from publishing “Wickel­stiche II”. Of course, I wanted to show how these new patterns looked in traditional Schwalm designs. So I embroidered some pieces, where I filled “old” designs with my new patterns and published them in “Stic­kereien”. 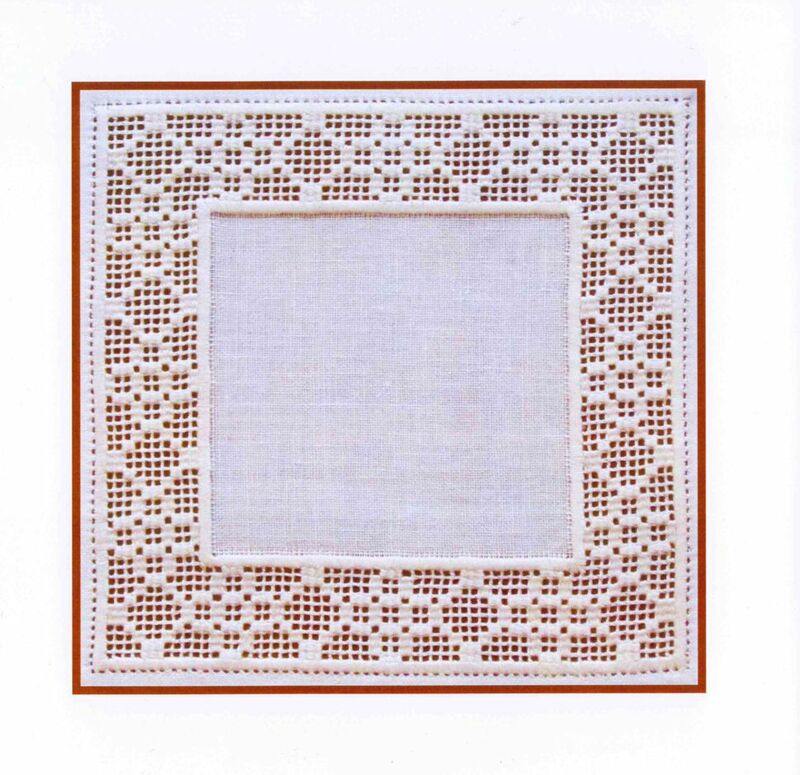 The piece shown here (beige fabric, item 3-1998), embroidered with my new and original patterns, was part of a well-known and special exhibition of Schwalm Whitework in the museum of Schwalm­stadt-Ziege­nhain in the year 2000. It received wide attention and met with great approval by the viewers. “If you have found such a large number of new and interesting patterns, why not share them with others? Why not write a book?” asked my husband. After a long time contemp­lating this sugge­stion, I set to work. I bought a personal computer and scanner. Slowly and with difficulty, but with conscien­tious effort and deter­mination, I taught myself how to use the various computer programs. Very gradually my first book, “Limet­rosen I”, developed. During this process, my teaching experience was put to good use; I was able to arrange the book’s contents as a written lesson. Early on I noticed that there were too many patterns for one book, so I divided the patterns into groups. During this time, my ambition awakened; I wished to create patterns that were completely new and never before documented. 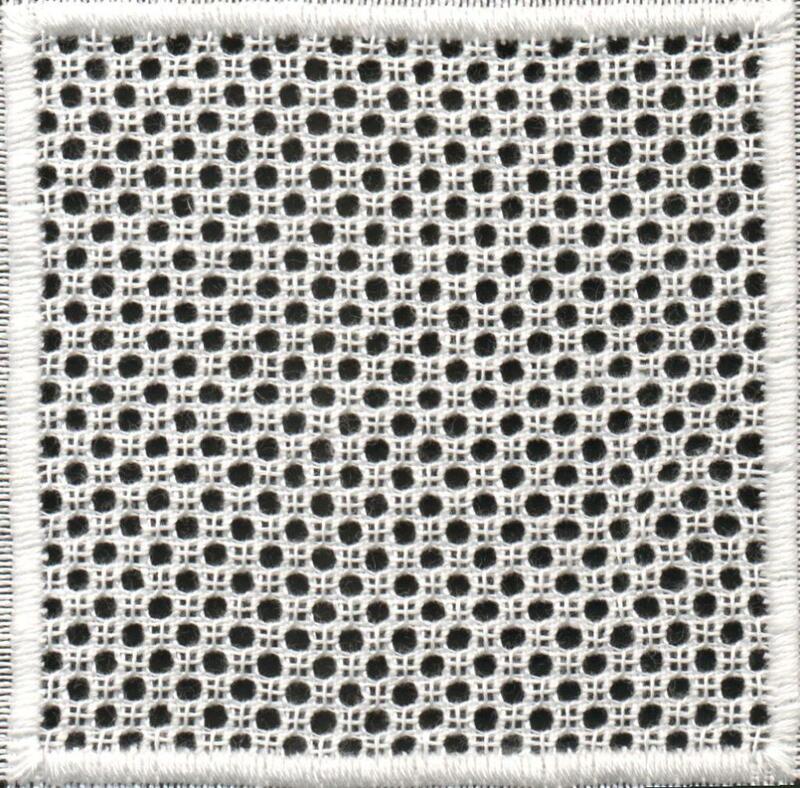 I succeeded by first dividing the traditional “Limetrose” (Square Eyelet) into different segments and then combining those segments into a multitude of differing patterns. Some of these are published in my first book “Limet­rosen I”. 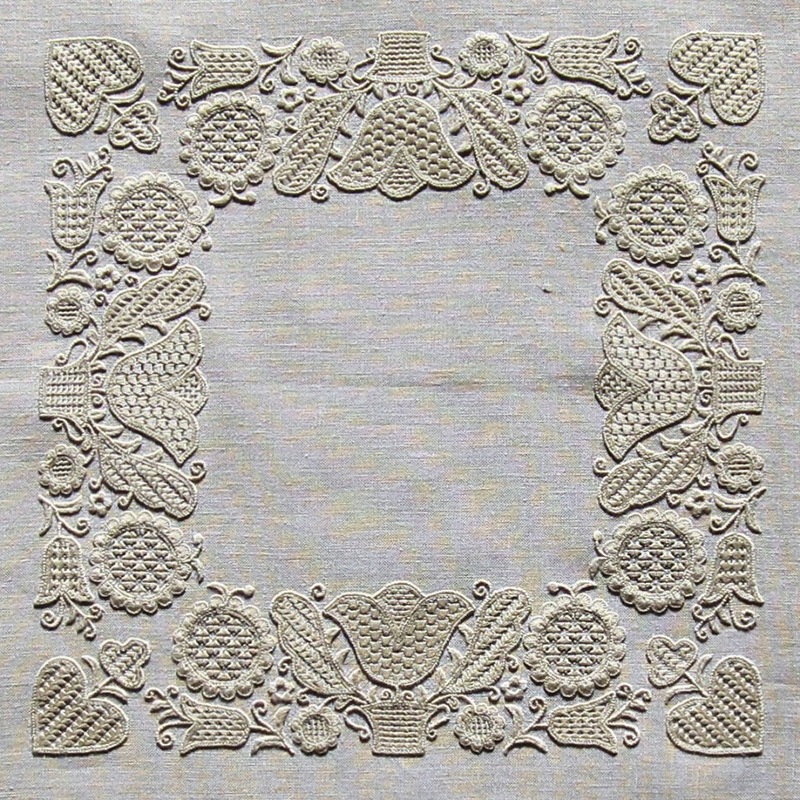 In Germany during the 1990s, Schwalm Whitework was very popular among embroiderers. After many women mastered the necessary basics, a regular contest was estab­lished to find new – never before discovered – filling patterns. 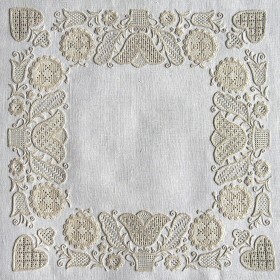 Schwalm Whitework lends itself to a nearly inexhaus­tible treasure of those patterns. 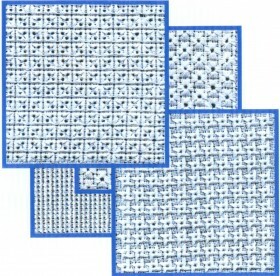 Unfor­tunately at the time, there were few published examples of filling patterns. 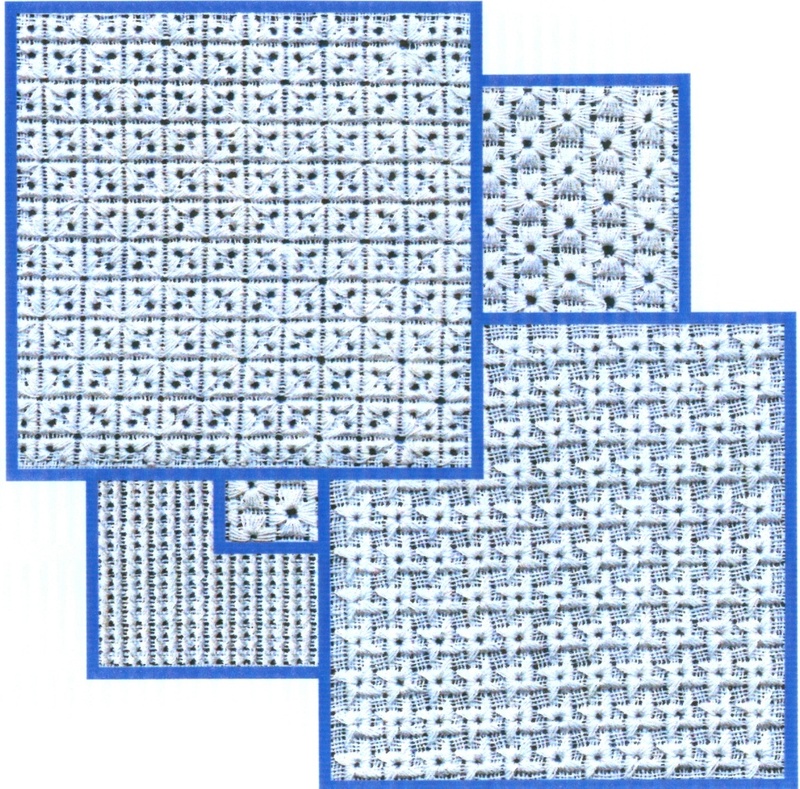 Most of the patterns, in the form of samplers, have been passed down within families from one generation to the next. The popularity of a pattern and the method of handing down a pattern were different from village to village. And so it was very enjoyable to collect all the different patterns and to stitch them into big samplers. 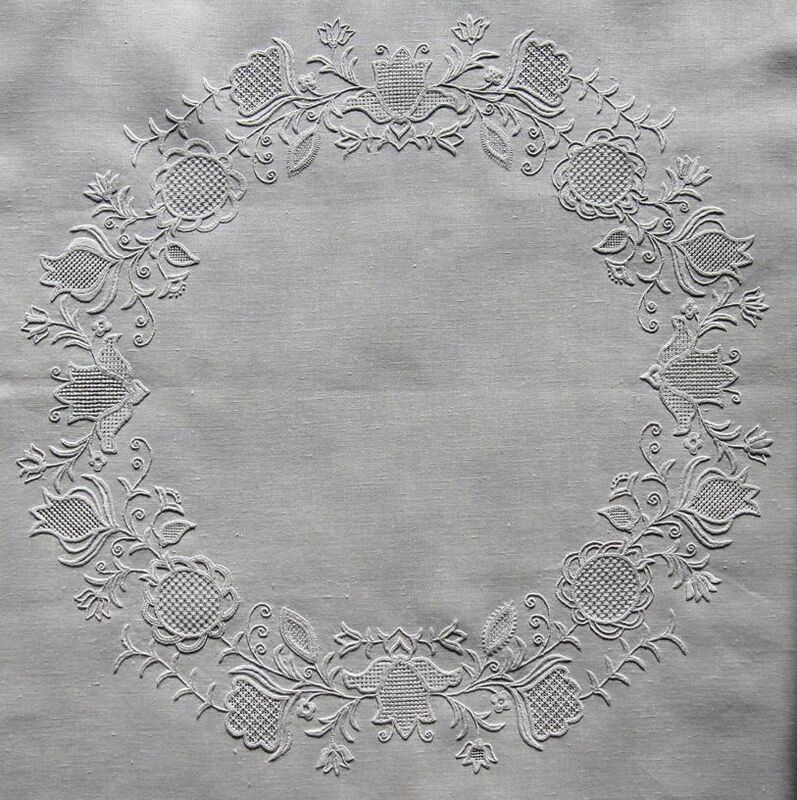 Interested in all kinds of needlework since my childhood and later trained to become a needlework teacher, I soon developed a particular preference for embroidery – especially Schwalm Whitework. 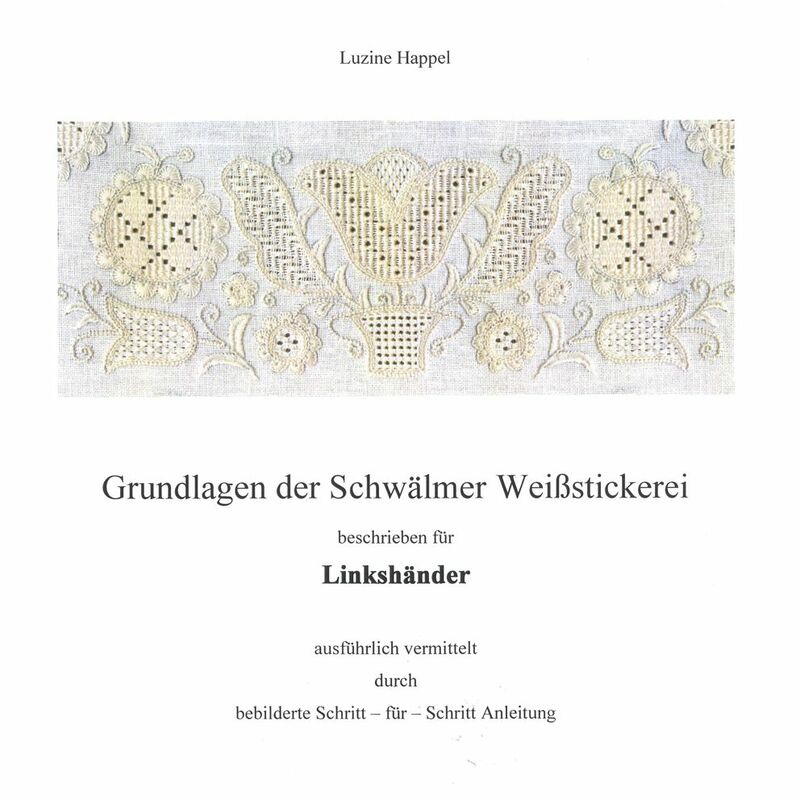 On the one hand my family roots go back to the “Schwalm” district, and on the other hand adult education centres were, in those days, making a noble effort to keep this precious embroidery alive. After the cancel­lation of needlework lessons from more and more Hessen school curricula, I resigned from my teaching job. Now I had a lot of time to embroider. Vielen Dank …. ich finde Dein Buch Old Schwalmwork sehr interessant !! Schwälmer Weißstickerei hat so unglaublich vielfältige Facetten – auch die Frühe Schwälmer Weißstickerei ist abwechslungsreich und interessant.